Increases in life expectancy, high rates of movement into and out of couple relationships, and increasing exposure to stepfamilies raise new questions about who is in a family, the distinction between who lives together and who is a family member, and the extent to which family members are expected to meet the long-term obligations that define kinship. These questions are important because families have traditionally served as a vital private safety net for family members. Demographic changes increase family members’ uncertainty about their relationships. Family ties are less stable and more uncertain among the economically disadvantaged, and uncertainty may exacerbate these disadvantages by weakening individuals’ ability to rely on family members’ support to alleviate hardship. I argue that demographers should focus on individuals’ family relationships to gain insight into living arrangements and family dynamics. 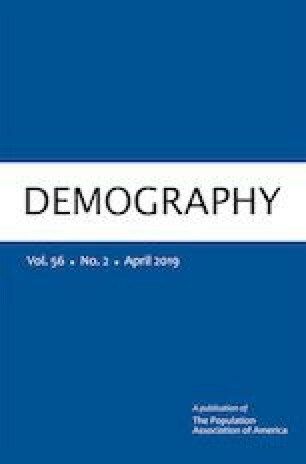 I also outline the development of family concepts and improvements in study design to identify principles that demographers should incorporate in new research to shed light on families’ support for their members. This is a revised version of the presidential address presented at the 2016 annual meeting of the Population Association of America in Washington, DC. This work was supported in part by the California Center for Population Research at UCLA, which receives funding from the Eunice Kennedy Shriver National Institute of Child Health and Human Development (P2C-HD041022). The research also received partial support from the National Institute on Aging (P01AG029409). The funding agencies are not responsible for any opinions expressed. Robert Mare, Siwei Cheng, Andrew Cherlin, Patrick Heuveline, Sara McLanahan, Robert Moffitt, Sung Park, Anne Pebley, Megan Sweeney, and Donald Treiman made valuable comments on earlier versions. Sung Park provided expert research assistance. I also thank the many colleagues who provided advice and helpful responses to my questions.